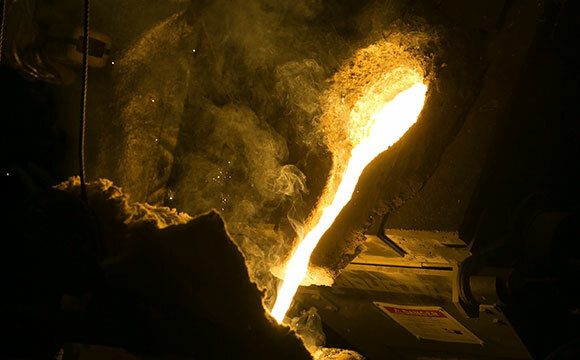 Molten steel is poured in the Missouri S&T foundry in McNutt Hall. A new third-generation advanced high-strength steel being developed at Missouri University of Science and Technology is designed to be strong, lightweight, and easy to make. This can help automakers improve fuel efficiency to meet the requirements of the U.S. Department of Transportation CAFE regulations. A high-strength steel being developed at Missouri University of Science and Technology could help auto manufacturers in their quest to meet future fuel efficiency requirements. The development of this new steel, known as a “third-generation advanced high-strength steel,” is under way at Missouri S&T’s Kent D. Peaslee Steel Manufacturing Research Center. Improvements in exhaust treatment systems, transmission efficiency and aerodynamics all contribute to better fuel efficiency. But reducing vehicle weight is also important in achieving the CAFE goals, O’Malley says. “Automakers must make lightweight vehicles without sacrificing safety,” O’Malley says. What is called first-generation steel is most commonly used in today’s cars and trucks. A second-generation product has been developed, and it is stronger and more lightweight than the first-generation material, but O’Malley says it is too costly to produce and more difficult to manufacture. The third-generation steel being developed by Missouri S&T metallurgical engineers should be lighter, easier to make and strong enough to address automakers’ safety concerns, he says. The S&T researchers are employing a method known as TRIP – or transformation-induced plasticity – to obtain the performance required to meet both safety and CAFE goals. It involves the transformation of an unstable crystal structure known as austenite, which normally exists at high temperatures, into martensite, a harder substance that develops as the steel deforms. “The S&T alloy design employs a two-stage or ‘dual TRIP’ mechanism that leads to extreme work hardening and energy absorption, so it’s very good for automotive crash-worthiness,” says O’Malley. The real challenge, however, lies with the large-scale production of these new steels. With the help of industrial partners, the researchers in Missouri S&T’s Peaslee Steel Manufacturing Research Center are examining all aspects of the steel manufacturing – “from melt practice to final formability by the automotive producer,” O’Malley says. A committee of representatives from four steel manufacturers – Nucor, U.S. Steel, AK Steel and ArcelorMittal – oversees the project. One benefit of conducting the research at Missouri S&T is the ability of researchers to create and test small batches of steel. In S&T’s labs, researchers can create 200 pounds of steel at a time, whereas big steel manufacturers like Nucor, where O’Malley was chief metallurgist before joining S&T, would have to make 170 tons of steel for testing, O’Malley says. 2 Comments on "New High-strength Steel Could Help Improve Fuel Efficiency in Automobiles"
no single number, no single property, which hints at the parameters of the steel.